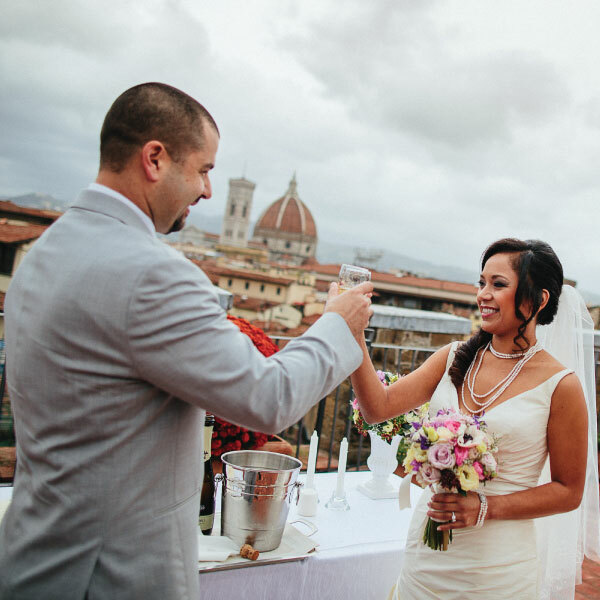 A wedding in Florence is nothing less than an unforgettable experience. A romantic and elegant art city, where you can breathe the authentic spirit of Italian art and history. Florence is known all around the world for its beautiful squares, tiny alleys and red rooftops. Give yourself and your guests the wonderful gift of spending some days in Florence. Let me assist you in the planning and designing of your unforgettable wedding in Florence surrounded by history, beauty, and love. Florence is the diamond of Tuscany, the city of the Medici family and of the most famous Italian artists and writers. Botticelli, Leonardo Da Vinci, Michelangelo, Dante Alighieri, just to name a few. A wedding in Florence is all about the location. Imagine yourself pronouncing your vows at sunset with the wonderful background of the Duomo and the red bricks rooftops. Or maybe you prefer to have the ceremony in a small church in the city center with renaissance frescoes on the walls and a soothing perfume of incense. In any case, I am here to make your dreams come true and to assist you with all the details of your wedding in Florence. First of all, let me know what is your dream and what kind of bride and groom you want to be. Also, let’s meet to see the locations together or let’s have a skype call to know each other and be on the same page. Finally, allow me to draw the project for your wedding in Florence with colors, flowers, inspirations. Florence is the place where the magnificent Italian Renaissance history lives along the streets of the city centre, in the world-famous cultural and artistic heritage, in the architecture of the ancient noble palaces and monuments and in its renowned and traditional Tuscan cuisine. A wedding in Florence is absolutely an outstanding and timeless Italian experience. Whether you are eloping with your loved one or you are envisioning a wedding in Florence with one hundred guests, service is always important. I have partnered with the best Florentine professionals to guarantee consistency and excellent quality of services. With my team, I have selected the most beautiful locations in Florence, the best caterers, and the most talented photographers. Together we will bring your wedding dreams to life and gift you with an unforgettable experience. Only one year ago, I was lucky enough to work for Nancy and Scott, an American couple that eloped in Florence. Nancy and Scott wanted to live their wedding experience privately. They got married on a beautiful terrace close to the Duomo, just the two of them. Then I booked a very elegant Bentley to drive them through the streets of Florence for their exclusive photo shooting. Their wedding day ended with a dinner in a private room of a hotel, with the view of Florence and the sunset over the Tuscan hills. I truly believe that what makes the difference between a wedding and a luxury wedding in Florence, is the bespoke service and the attention to details.